The Contributor | Can Colorado House Dems' Huge Fundraising Advantage Hold? Can Colorado House Dems' Huge Fundraising Advantage Hold? In order to gain control of the House, Republicans need to win at least five seats this fall — without losing any incumbent legislators — which is a mountain that may be too tall for the GOP to climb in 2014. As a Colorado Pols analysis of fundraising results in key House districts shows, Democrats are raising significantly more money in competitive House districts compared to their Republican counterparts. 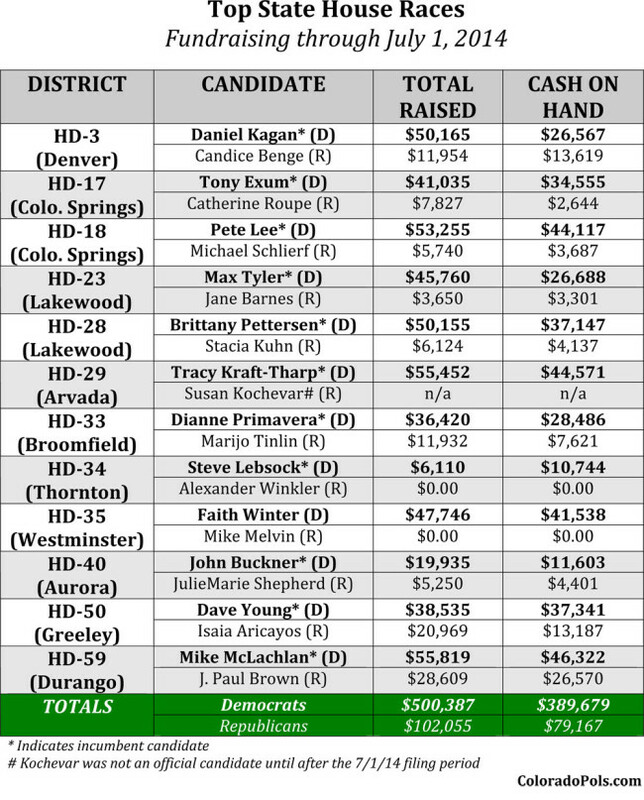 We took a look at 12 of the top House districts (you can argue that your list of top races would look a little different, but you get the point), and through July 1, 2014, Democrats have raised more than $500,000, while Republican candidates combined for just a tad more than $100,000. While so-called "soft money" from third party groups, PACs, and other special interests will certainly prove a force majeure in many races, the disparity between the two parties is still quite stunning. Take a look at the chart below — there is not a single Republican candidate who has raised even close to the totals compiled by their Democratic counterparts.